Hi-Tech Off The Chain: The First Energy Aminos with DMAA! Natural and artificial flavor, citric acid, malic acid, calcium silicate, silicon dioxide, sucralose, acesulfame-k, FD&C blue No. 1, FD&C red No. 40. Mix 2 scoops in 8-10 oz of cold water. As with any dietary supplement check with your physician prior to use. Do not use this product if you have any current or previous medical condition of any kind. Such conditions may include but are not limited to high or low blood pressure, stroke, arrhythmia or palpitations. Any heart, thyroid or live condition. Seizures, anxiety or depression, prostate enlargement or inflammation. Do not use if pregnant or nursing. Do not use if taking an MAOI. If any adverse symptoms occur, discontinue use immediately and consult a physician. KEEP OUT OF REACH OF CHILDREN. Do not take for more than 8-10 weeks without an 8-10 week off period. Mar 10, 2016 Hi-Tech Off The Chain – DMAA Powered Energy Aminos! The best Amino Energy supplement just got better! With new flavors like Southern Sweet Tea, you'll want to sip on Off the Chain all day long! Hi-Tech's OFF THE CHAIN is without a doubt the most focused energy amino supplement on the market, thanks to its 20mg DMAA in each dose! See our YouTube review below - everyone at the gym loves this stuff! New review: Southern Sweet Tea! ADDITION of DMAA: DMAA is a neurological stimulant which causes a rapid spike of energy similar to Caffeine and other classical stimulants but does so by different mechanisms in the brain. OFF THE CHAIN includes a low dose (about 1/3 of typical pre workout powders) to keep users of preworkout products from "crashing" but allowing continuous all day energy without causing sleeplessness. LESS L-Taurine: L-Taurine is is a sulfur-containing amino acid that does not belong to the group of 20 Proteinogenic Amino Acids. L-Taurine is also the cheapest amino acid available in manufacturing and is why many companies load their products with it. OFF THE CHAIN Aminos Promotes Nitric Oxide Production with Micronized L-Arginine To Support Nitric Oxide Production and Micronized L-Citrulline To Promote Nitric Oxide Production throughout training. OFF THE CHAIN Aminos contains a healthy dose of Essential Amino Acids to Accelerate Protein Synthesis and help achieve faster recovery enabling users to grow. Like so many Hi-Tech supplements hitting the market, new research studies are sparking a BCAA resurgence. Taking amino acids may sound boring and outdated, but there are many reasons why OFF THE CHAIN Aminos allow for a lot of exciting, growth-producing reasons. First, BCAAs are comprised of three amino acids - leucine, isoleucine, and valine - that when taken together, can produce impressive improvements in strength, lean mass, energy production, and fat loss. BCAAs not only perform these actions independently, but can also increase hormone production for additional muscle gains and prevention of catabolism (muscle breakdown). In short, BCAAs promote protein synthesis in muscle, provide energy in muscle directly (an effect exclusive to these three amino acids), decrease soreness following exercise, increase exercise endurance, and increase testosterone, growth hormone, and insulin. BCAAs may comprise up to one-third of muscle protein, making them the power plant amino acids for muscle building. OFF THE CHAIN Aminos contains over 1,250mg of L-Glutamine, which is the most abundant amino-acid within the body and is primarily stored and synthesized within the skeletal muscle. When an athlete puts their body under great metabolic stresses, like heavy training exercise, that can deplete the body of its natural stores of glutamine. In these situations, glutamine becomes an essential amino acid that needs to be supplemented to keep form a catabolic state. L-Glutamine increases intra-muscular stores of glutamine and increases the cell volume of the muscle. Glutamine also increases muscle protein synthesis, as well as decreases degradation of muscle protein. Glutamine has also been shown to increase plasma growth hormone levels as well. Now Hi-Tech researchers have taken one of its original powerful amino acid formulas and made it much better! 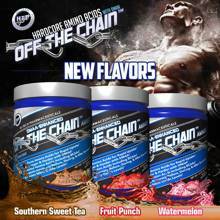 OFF THE CHAIN Aminos Introducing is a powerful new formula updates the original OFF THE CHAIN formula with DMAA, L-Glutamine, Essential amino acids, L-Citrulline, and other powerful amino acids. And unlike other underdosed products that have little or no positive effects, OFF THE CHAIN Aminos will help build muscle, strength and performance! 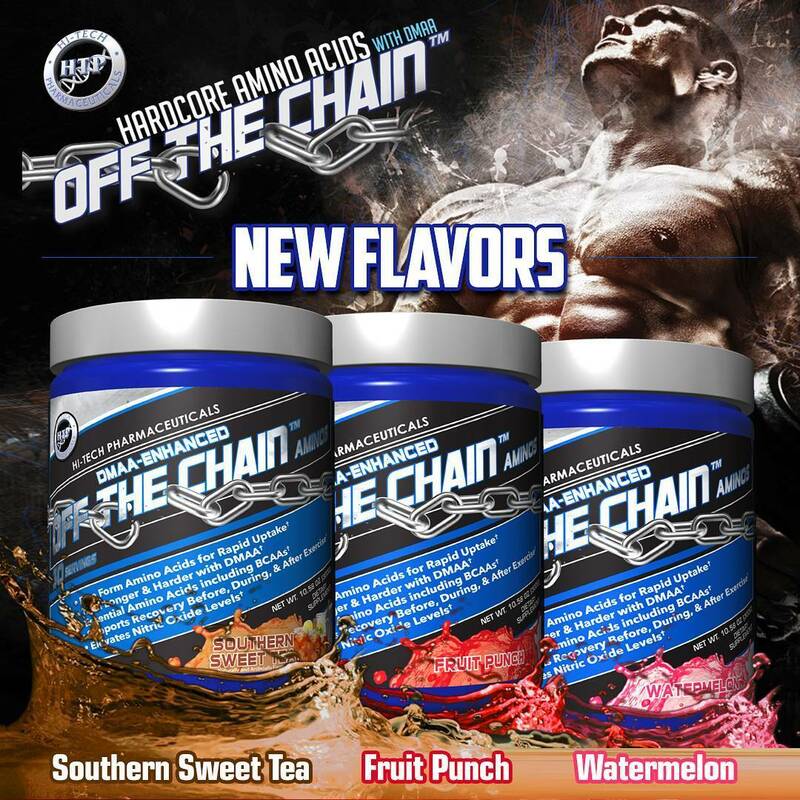 Hi-Tech's release of OFF THE CHAIN Aminos has turned the "BCAA and EAA category on its head!" Try OFF THE CHAIN Aminos and begin feeling its effects within minutes. Green Apple Candy This is a Buy 1 Get 1 FREE offer! Rocket Pop This is a Buy 1 Get 1 FREE offer!